The official Twitter account of Iranian Supreme Leader Ayatollah Ali Khamenei today posted what it termed as Iran’s major red lines in nuclear negotiations. The seven items listed as red lines cover three basic areas: sanctions relief; sunset provisions for uranium enrichment as well as R&D; and access for inspectors. The red lines appear to be in breach of the framework agreement announced in Lausanne in April by the Iranian Foreign Minister Javad Zarif and EU foreign policy chief Federica Moghirini. I mentioned in the previous post how it was unfortunate the NATO military-effected regime change in Libya has served to provide the Iranians with an adverse example of unlimited openness. So too the politicization of the IAEA with the selection of Amano has also damaged Iran's trust. Here it is in no uncertain terms, they do not trust the IAEA. Now it's up to our American negotiators and the Obama administration to come up with politically acceptable terms (domestically), otherwise it appears the Iranians will walk away. They were willing to do so before the previous deadline was extended. Amano and Libya? They had happened years prior to the start of the nuclear talks, and Khamenei was well aware of them. Still Iran chose to come to the negotiating table and indeed agreed to a framework for a final deal in April in Lausanne. Now, after three months since Lausanne, Khamenei puts up red lines that appear to be in breach of the Lausanne agreement. Khamenei is probably the one who is walking away from the negotiation table. Khamenei and the hard right in Iran did not want a nuclear agreement with the West, they were hoping that Israel and the hard right in this country would kill any agreements that would emerge from the talks, but now at the eleventh hour are trying to stop it themselves by publishing red lines and passing legislature in Majlis and have it approved in the Guardian Council, all within hours of each other, contradicting their own government's agreements at Lausanne. This is sad. I think stating that Iran's decision to negotiate was a "choice" is a bit over stretching it; Iran had no other alternative but to negotiate. Whether Khamenie wants a deal or not is a matter of conjecture, we certainly can't read his mind nor we know much about his inner thinking. However, he is NOT the only influential constituent in the Iranian system, although perhaps the most powerful one. The question should be whether "the system", as the mullahs like to refer to Islamic Republic, benefits and survives in its current form by reaching a negotiated settlement. I believe it does. Yes Nader, Amano and Libya took place prior to these latest nuclear talks but they do have a bearing on the negotiations as evident in the above table. So does the prior experience of Iraq and inspections, where inspections contributed intel towards the subsequent war. Today U.S. Congress came out with its demands and they're every bit as extreme as SL Branch of IRIG. If anything, Khameni managed to preempt them. But I agree, the odds of a deal are stacking and that is indeed sad. Iranian negotiators went into the talks knowing full well the historical events you are referring to, yet Iran decided to attempt to cut a deal with the West over its nuclear program. Iran and P5+1 ended up agreeing on a framework for the final agreement on 2 April. Zarif, or Rouhani, would have not agreed to the framework deal in Lausanne if they did not have Khamenei's blessing. 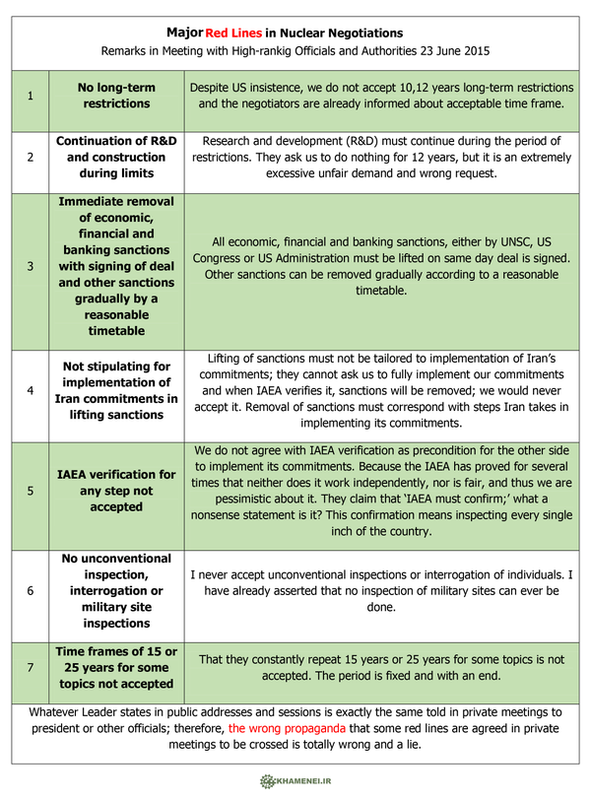 Now, days before the deadline, the supreme leader publishes major red lines that contradict the framework agreement in major areas. Of course both countries' parliaments need to approve any final deal struck in Vienna. If a deal is reached before 9 July, U.S. Congress will have a 30-day review period, otherwise the period increases to 60 days. Iran's Majlis will approve any deal that has the backing of Khamenei. These are indeed difficult days after two years of negotiations. Let's hope cooler head still prevail and we'll have a deal. If you would not prevent my and other comments, the deal would have better chances.